It's nice to bring news of things which aren't your usual release, and this one is definitely not that. 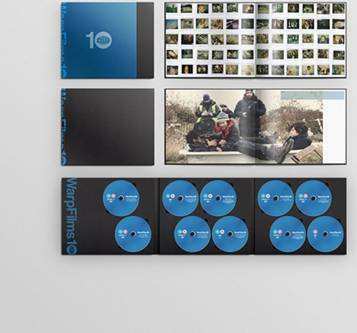 To celebrate their 10th Anniversary, Warp Films are releasing a special WarpFilms10 Book and DVD set, which you can pre-order now from Bleep.com for delivery on 18th November. The first 1,000 copies will also be hand numbered and signed by producer Mark Herbert, and note that if you fancy collecting this there will only be one production run, so pre-ordering may be your only chance of getting it for the special price of £80, rather than the recommended retail price of £95. The book will be a 250 x 300mm landscape, 206 page full-colour, case-bound affair. Featuring a foreword by Chris Hewitt and an exclusive interview with and Warp Records’ Steve Beckett. 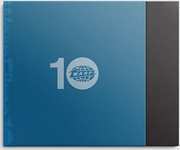 The three panel DVD book contains 10 of key Warp Films feature films, with exclusive new on-body artwork, all region 2. The whole set will come packaged in a semi-translucent polypropylene silkscreen-printed 2-colour slipcase. Who says in this world of digital there is nothing worth collecting anymore?